I received my Jumper T8SG Plus radio with the following firmware version: t8sg_v2_plus-v5.x.x-2018-04-19. I would like to know where is the latest firmware version for this radio. How to perform this firmware update. For upgrade latest firmware t8sg v2+, Im using windows 10, what program should I install? is it deviation uploader 0.9 or Dfuse USB upgrade tools 2.31.exe? Almost impossible to kill transmitter by firmware upgrade. Probably you flash wrong firmware. Try to start firmware upgrade mode and flash proper firmware for "t8sg_v2_plus". Hi, on Ubuntu 16.04 how can upgrade firmware for T8SG V2.0 Plus ? Can you help me with some direction, please. I connect via USB cable. I open T8SG V2 Plus with Ent on power up. I see USB symbol on station's screen, but Ubuntu do not see. If I open with ESC on power up, on screen nothing. 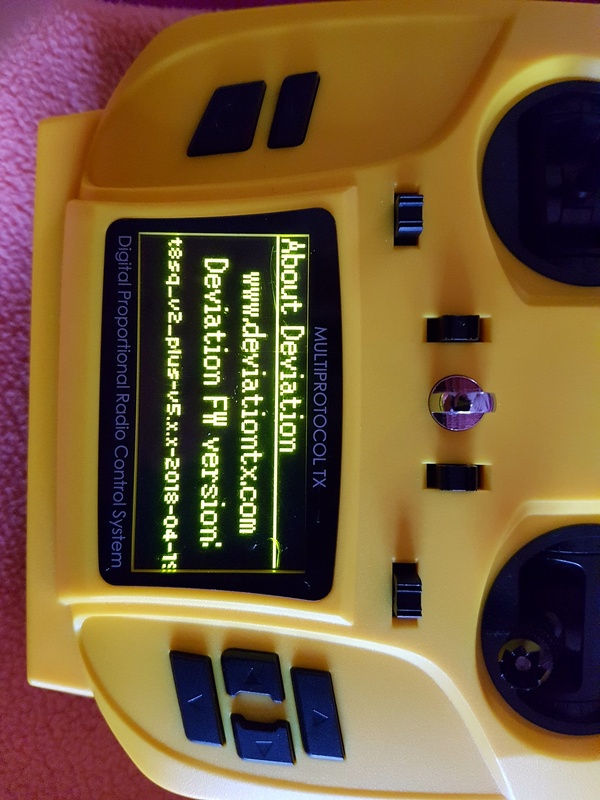 DeviationUpload-0.9.0.jar work, but not see T8SG. What to do ? Thank you for your help. I need it. I want to can access via USB, and write the last firmware. With stock firmware is not possible to connect to PC (Ubuntu) ? Last edit: 10 Sep 2018 18:14 by popad. Hi, on Ubuntu 16.04 or other Linux, how can upgrade firmware for T8SG V2.0 Plus ? Can you help me with some direction, please. I have tried on Windows XP and 7, all drivers. Just "defective USB device" I receive. What can I check on motherboard to see if USB connection can be made with success ? Any advice ? Must change the motherboard for that ? All functions are right, only USB connection to any PC is not possible. Last edit: 27 Sep 2018 07:54 by popad. first without connection your transmitter, after that connect the transmitter and see if your usb is detected. I have tried lsusb, but I don't see my T8SG V2 Plus. I will try on Ubuntu 18.04.1, again, but from what I already saw, it's something flawed with USB part on my station. I don't know how and what I can check about that. In rest station works fine, no problem. All this summer I flew my micro dlg gliders with it. Last edit: 28 Sep 2018 12:52 by popad. No progress for me. dfu-tool list, report nothing. lsusb don't see T8SG V2+. I try on windows XP (old laptop), no success. Hi, I wanted to update FW to solve blank screen problem. At the beginning I was not able to go through FW update on Windows 10, I just changed PC, all good on 7. But I'm still stuck on screen problem, FW update did not solve the problem, do you have any idea? screen is not totally dead because it can display USB logo. Try to format USB drive and write filesystem from firmware archive. vlad_vy wrote: Try to format USB drive and write filesystem from firmware archive. I got my T8SG plus today and I try it for some drone like FQ series, JJRC, Eachine series. I can't bind JJRC series H36 and Eachine EO01. Anyone know what the protocol series for bind it.